BMW tightens supply of X3 crossovers in U.S.
BMWs X3 is made in Austria, and the strong euro has cut into profits on vehicles sold in U.S. dollars. U.S. production of the X3 will begin next year. BMWs X3 is priced higher than 3 new rivals. Rather than slashing the price or pouring on incentives, BMW is limiting the supply of its European-built X3 compact crossover to maintain profits until it shifts production to South Carolina. Sales of the $40,000-plus vehicle fell to 394 units last month, down 64 percent from January 2008, and dealers throughout the country reported shortages. BMW sold 17,622 X3s in the United States last year, down from the high point of 34,604 in 2004. A BMW spokesman says the sales drop was planned as part of an effort to limit X3 imports. Last year BMW cut its overall U.S. allocation by 40,000 units but declined to break out the number of X3s. Tim Smith, owner of Bob Smith BMW in Calabasas, Calif., says BMW has cut supply so radically that he has no X3s in stock. Says Smith: "It will hurt us. 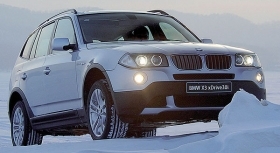 We do well with the X cars, especially the X5." X3 profitability is a problem for BMW. The X3 is made by supplier Magna Steyr in Austria; the strong euro has cut into profits on vehicles sold in U.S. dollars. In 2010, BMW will begin assembling the redesigned X3 at its factory in Spartanburg, S.C.
A BMW spokesman says the move means "changing the cost structure of the vehicle." The X3 is expected to grow in size to make room for the smaller X1 crossover, due in about two years. BMW also faces a wave of lower-priced competitors. Mercedes-Benz estimates the segment will grow to 140,000 units by 2010. The segment was about 52,000 units last year and included the Infiniti EX35, Land Rover LR2 and Acura RDX, according to the Power Information Network. Pricing is perhaps the biggest problem for the X3, which debuted in 2004 with little competition. The base X3 costs $40,525, including shipping. Three new entrants — the Mercedes-Benz GLK, Audi Q5 and Volvo XC60 — are all priced more than $2,000 below the X3. In January, the average transaction price of a premium compact SUV/crossover was about $35,000, compared with $43,600 for the X3, according to the Power Information Network. Jesse Toprak, senior analyst at Edmunds.com, says $35,000 is usually the threshold for entry luxury SUV/crossover buyers, "if you really want to grab people." Says Toprak: "The price point has always been one of the weaknesses of the X3 — it really needs to be between $35,000 and $40,000."